Putting your stockpile together can easily drain your grocery budget if you’re not careful. Luckily, some of the best foods for stockpiling are extremely cheap to buy. No matter what your reason for stocking up, whether it be emergency preparation, a good sale or just to have extras on hand, these 25 budget foods to stockpile are all fantastic to add to your shopping lists. 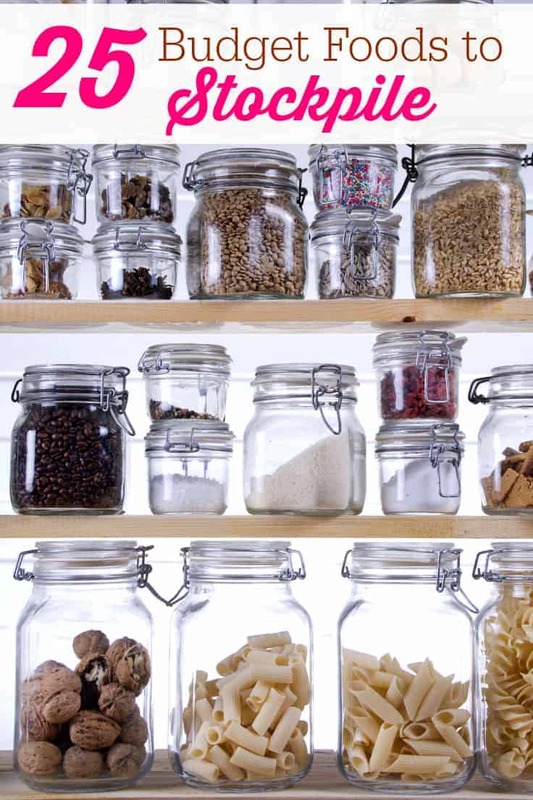 The biggest thing to remember about food storage is that you may have to include items you wouldn’t normally eat. The idea behind having a stockpile at all is that it is there when you need it. This means that you may want to consider adding a few items that you wouldn’t otherwise use to your pantry just in case of an event like job loss or a weather emergency. Things like jarred sauces and canned vegetables will be there when you need them versus fresh foods that will spoil without preparation. To make sure that you’ve got what you need to properly store your food stockpile, be sure that you pick up a few food grade buckets and lids. You can generally find them at home improvement stores pretty cheap. Make absolutely certain that your buckets are food grade. Otherwise you could be leaching nasty things into your food and not even know it. 1.Rice. It’s super cheap and very shelf stable. This means you can stock up without too many worries about it going bad or spending a bunch of extra cash. To be sure that no critters get into your storage, keep it in buckets or a canister for longer term storage. 2. Flour. White flour may not be the best for your health, but if you’re relying on your food storage to feed your family, that shouldn’t be your main concern. Buy it in bulk sized bags to save the most then break down into smaller ones if you need to. Freeze each bag to kill off anything that may have gotten in during shipment and store bagged either in your freezer or in large food grade buckets with a lid. 3. Sugar. Sugar is another fantastic budget item with one caveat. The price seems to fluctuate a lot on it so it isn’t good to stock up on all year round. The best time is around a major holiday where people do a lot of baking. Just like with flour, buy in bulk and store bagged in buckets with lids. 4. Pasta. Pasta is and will most likely always be cheap. Stock up on your favorite kinds for less than a dollar a pound. Pasta will keep just about forever if it’s stored correctly too. Remove it from its packaging and store it in air tight containers for long lasting storage. 5. Pasta sauces. Just like with pasta, jarred sauces are great to have on hand and are usually fairly cheap to buy. Grab a few jars of your favorite brand. Store them in the pantry like you normally would. 6. Canned vegetables. At a cost of under a dollar most places, picking up a few extra cans is very affordable. If you’re worried about salt content, give them a good rinse before you use them. 7. Canned Fruit. Along the same lines as canned veggies, canned fruit is another budget food to stockpile. 8. Basic Spices. Basic spices like pepper, garlic and so on are affordable and they will last for quite a while if kept in air tight containers or the freezer. 9. Butter. Butter can be frozen and will last almost a year in the freezer. Stock up around the holidays when it’s cheaper and save it for when the cost jumps. 10. Cream Cheese. Another one that can be bought cheap and frozen, cream cheese is a great budget food to stockpile. The only catch is that once it’s frozen, it’s best for baking and cooking and not quite so tasty on a bagel. 11. Eggs. I know it sounds crazy, but eggs are a fantastic item to stockpile. Pick them up when they’re cheap and preserve them for later. Once they’re preserved, they are shelf stable for 6-9 months. 12. Bread. Bread is another item that is truly budget friendly and can be frozen for storage. I buy loaves when they are on sale and freeze them. Then just defrost as you need them. 13. Cereal. The next time your store has a sale on cereal, grab a bunch and store it. It will last 3-6 months (or more) in its original bag. 14. Baking Soda & Powder. There aren’t too many dishes that can be baked without at least one of these two ingredients. Buy them when you have a bit of extra grocery money and store in airtight containers. I keep multiple boxes of baking soda on hand because I use it in cleaning, too. 15. Popcorn. While not a necessity, popcorn makes a fantastic snack food for the kids. Typically it’s just around a dollar per pound and can be stored in its original packaging. 16. Granola & Granola Bars. Granola will last almost a year if stored right. Seal it in individual bags for loose granola and leave pre-packed bars in their original packaging. 17. Crackers. Saltines are another awesome budget food to stockpile, but any type of cracker works well. For long term storage (meaning more than 3 months), keep them in the freezer so that they maintain their freshness. 18. Oats and Oatmeal. A couple of times per year oats and oatmeal goes on sale. Stored in an airtight container, they will last for quite a while. 19. Canned Meat. Canned tuna and chicken are very affordable and can be used to make a very wide variety of meals since they are often interchangeable. Both will last 2-5 years on the shelf as long as their cans are not dented. 20. Canned Soups and Stews. They’re not the healthiest option, but canned soups and stews are filling and warm when you need it. Be sure to stock a few just in case. If you’re worried about sodium content, add a bit more water than is called for in the directions. It won’t cut the taste too much. 21. Macaroni & Cheese (aka Kraft Dinner). The blue box may not be the healthiest box, but it’s a quick fix when you need something in a pinch. The best part is that it can be fixed with powdered milk or no milk at all so it is a great food to stockpile for any sort of emergency. 22. Milk. If your grocery store has milk on sale, grab it and freeze it. Milk prices fluctuate pretty heavily so grabbing it while it’s cheap is just a smart move for your grocery budget. Just be sure to pour a bit off of the top before you freeze to allow for expansion. 23. Tea. Tea will last well over a year, especially if you buy tea bags. Store in an airtight container to help extend the shelf life. 24. Juice. Most juices, apple juice especially, are very affordable during back to school months. Buy them then and keep in your stockpile for use during the year. They will last on the shelf at least a year, but sometimes longer depending on the type of juice. 25. Coffee. Coffee, while not exactly cheap most places, stores extremely well and goes on sale often. Use those sales to your advantages and stock up when you can for less. Leave them in their original vacuum sealed package for shelf life. What foods are in your emergency stockpile? I have many of these items in my stockpile! I have never froze cream cheese so I will have to remember that one. Curry paste is included in our stockpile. We use it quite often, so many great options, And it keeps well. Love that you put popcorn on your list! It’s definitely a necessity in my life… LOL! But, its a great list. I always stockpile most of those items as they keep well, great in an emergency and standard in my pantry. Thanks! Great list! I like to keep a mental list of what the average price of things like this are, so when they go on sale I know if it’s ACTUALLY a sale and can buy a few. Pasta and sauce, as well as soup are definitely items that I stockpile. I have bags of sugar in the freezer, as well as frozen fruit. I try to keep well-stocked whenever there is a sale. I have everything on the list, plus fruit cups, snack bars, and hot chocolate only because my son goes through those all like crazy. What a great list. I’m sharing with our FB friends! Great list! I stock up on pasta, Soups, Mac & Cheese whenever they’re on sale. I’ve never thought to stockpile eggs or cream cheese. We stock pile a lot and include toilet paper and paper towels, Noodles and sauce, canned Chef Boy are dee Alphagetti. Stockpiling can be costly up front but really save you money and stress later. Love shopping the rice and pasta sales. You can easily stockpile them and they last so long. Great tips on freezing for later. I can say I stock pile most of these items. I also freeze cheddar cheese. Very interesting post – some I could have guessed, but some like eggs I would not have! SALT! It lasts forever is super cheap and can be used many different ways. It can be used as a flavoring, to cure, pickle and preserve meats, fruits and vegetables. It can also be used as a sore throat gargle and wound cleaning. It works on the driveway and sidewalks on snowy days too! Most important-Water (clean, purified, and some alkaline ones as well. These are all things that I already stock up on but I also stock on dried beans and lentils in the autumn months because we have a lot of soups and stews during the colder seasons. They are inexpensive and filling. I buy and freeze extra liquid coffee creamer. Even though the bottle says do not freeze I’ve been doing it for over a year now and notice absolutely no difference. That way when I need creamer for my coffee or even my hot cocoa I have some on hand. Thank you for publishing this article. I am already stockpiling, but I have a question about grocery stores. I’m thinking about enrolling into membership for Sam’s Club because I believe it will help me to stockpile on a budget since I’ll be buying in bulk. I am single and I live by myself, so do I really save money by going to Sam’s Club or would it be better if I go to traditional stores like Walmart? Thanks! I don’t use Sam’s Club or the equivalent here in Canada (Costco). I shop at the regular stores like Walmart, Food Basics, etc. If we had one here, I’d go in and compare prices to see if the savings would be worth it or not to buy a membership. cubes or canned broth fir soup.